Alexa Baker clears the ball in the first half of Republic's win at Carl Junction. Sometimes you play it by the book, and sometimes you throw the book out the window. Republic soccer coach Kevin Hauck did the latter Thursday night at Carl Junction, and it helped his Lady Tigers break through for a 1-0 win. 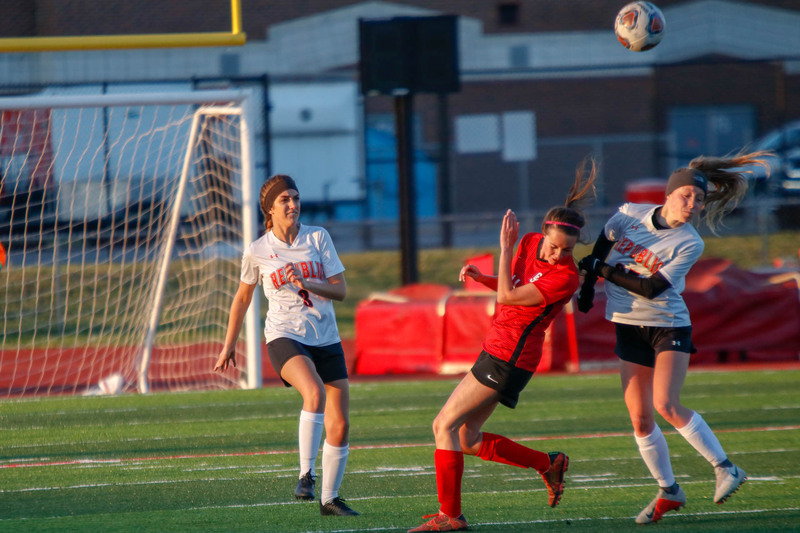 Republic dominated possession for most of the night, but Carl Junction relied on a defense-heavy strategy to keep the Lady Tigers off the scoreboard. The Bulldogs packed most of their players into the middle of the field right in front of the goal, making it difficult for Republic to get a clear shot despite constant pressure. To compensate, Hauck re-wrote his game plan on the fly, abandoning the left wing in the midfield to get more pressure up the middle. About ten minutes after changing up the formation, Republic finally got on the board when Fronabarger got the ball 35 yards from the goal, dribbled between four defenders, and slid the ball from right to left into the far corner of the goal. It was Fronabarger’s 19 goal of the season in just 11 games. Republic took shot after shot in the final 25 minutes, and even though the Lady Tigers failed to score again, the added pressure in the middle of the field helped them keep possession most of the rest of the game. “It’s not something that you always want to do, but… the way things were going, the left wing wasn’t being used anyway. We could use extra help in the middle to try to find some sort of run or some sort of shot, and it was able to work for us. So, hey, I’ll take it,” Hauck said. The Lady Tigers improved to 8-3 overall. They’re 2-0 in the Central Ozark Conference. The Republic JV team won its game 2-0. Republic not only shut out Carl Junction, but the Lady Tigers barely even allowed the Bulldogs to take a shot all night. Grace Lightfoot, in the middle of the Republic defense, played a big role in that effort. She and her fellow defenders enabled Republic to get more creative and aggressive up top, leading to the game-winning goal. For her defensive effort, Lightfoot is our Farr Better Player of the Game.